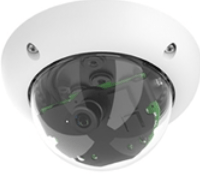 With the D25M series, Mobotix offers extremely compact, versatile and cost-effective mono dome cameras with up to 1,536 scan lines, an integrated video sensor and longterm internal storage on a MicroSD card. All D25M models come with an easily interchangeable lenses and a robust 1.5 mm thick polycarbonate dome. An extensive range of accessories is also available for installing the camera in an application-optimized manner, for supplying power or expanding the functions of the camera. Mobotix D25M cameras are suitable for use in large-scale facilities like airports given their unlimited scalability and high performance. However, they are equally suitable for use in small commercial or private buildings thanks to their integrated event, storage, alarm and telephony functions.